Since I had to move back to Western, NY last fall for my mother's failing health, I have discovered (by accident) an 1810 house near her nursing facility that reminds me of the Brontë Parsonage. It is at the end of a lane, and when I was waiting for traffic to pass, I thought I was looking at the Brontë house - or one similar in style. Here are photos of the exterior and the inside window. 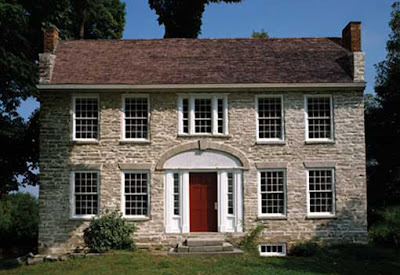 This is the Hull House, built in 1810, which the community is trying to renovate back to its original state. I see that it was built about 30 years after the Brontë Parsonage and wondered if there was any English inspiration to it. I will have to research further. I have a nice warm feeling that I am back in Haworth -- if but momentarily -- when I go visit my mother.